We have a teenager from Paris visiting us for twelve days. We met their family many years ago and have remained friends since. 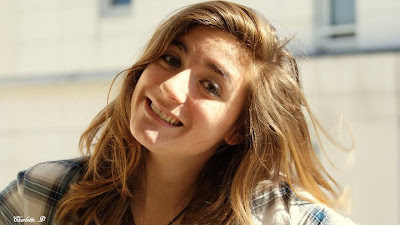 Their daughter, Justine, is 13-years old and amazingly beautiful and intelligent. She and our son, who is also 13, get along famously. Justine's equally gorgeous and brilliant mom sent along some incredible gifts for me, including a French cookbook and these adorable cocottes made by le Creuset. Justine and I wanted to make a recipe from the cookbook and use these cute ramekins. 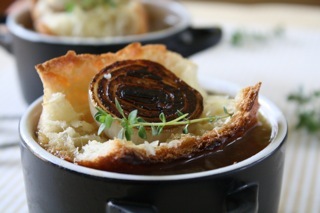 We decided upon Soupe à l'Onion, or French Onion Soup. Justine loves to cook but usually doesn't have time to do it at home. She also has an interest in photography so several of these photographs are hers (as noted). The best part (besides eating it) was the fact that we were so starved that I'm pretty sure our stomachs had begun to eat themselves. 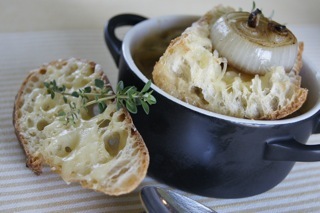 And to make a proper French Onion Soup, one must cook the onions a long time. A very long time. As in 2 + hours. Meanwhile, we smelled the intoxicating aroma eminating from the kitchen as we sat on the deck in the sunshine, reading our books and tapping our feet impatiently. I know, I know. Every American bistro's menu has French Onion soup on it. And chances are it's loaded with rubbery, gag-inducing cheese, soggy sandwich bread, and a handful of still-crunchy onions swimming in a sea of beef water. Ewwww. 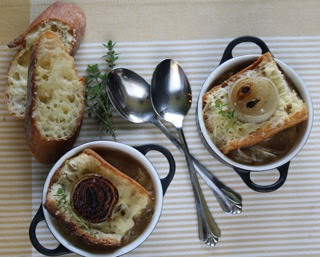 I can assure you, this will be the best French Onion Soup you've ever had. The soup is flavorful and deeply onion-y. 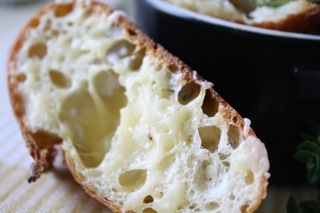 The nutty, cheesy melted Gruyère lends a salty tone. 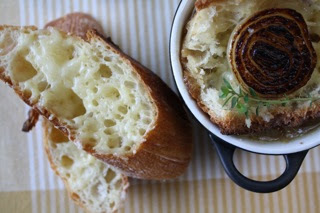 The crusty bread will soak up all that rich broth. 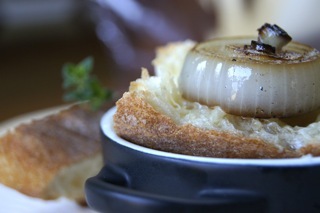 And the onion topper on the crostini adds a nice crunch and another onion flavor source. 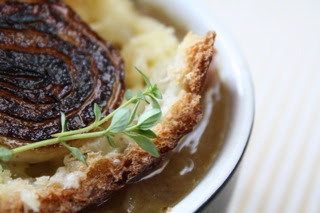 This version goes lighter on the cheese, cooks the onions forever until well caramelized, and under no circumstances can the chef use anything but the best bread you can buy. I adapted this recipe slightly from the one in the cookbook. Instead of using water and the overly salty and oftentimes bitter bullion cubes we have available to us in the states, I used low-sodium beef broth. We also cooked the onions much longer than stated in the original recipe. Peel and thinly slice the large onions. Melt 4 T. butter in a Dutch oven over medium-low heat. Add the sliced onions and stir to coat. Don't be worried if the onions fill the entire Dutch oven. Place lid on top and cook, tossing occasionally, until softened. This process may take an hour or more. Once you see that the onions are well softened, remove the lid and continue to cook, tossing occasionally. If you see there is too much liquid in the bottom of the pot, carefully spoon it out and reserve. Continue to cook until onions are deep golden brown in color, a total of 2 hours or more. Add any reserved onion juices, the beef stock, thyme (entire sprigs), bay leaves, and 2 t. salt and bring to a boil. Simmer for 10 minutes. Meanwhile, peel the smaller onions. Slice the ends off. Slice 1/2" thick slices, keeping rings all together. Melt remaining 2 T. butter in skillet over medium-high heat. Add onion slabs and cook until starting to caramelize, flipping carefully with a spatula. 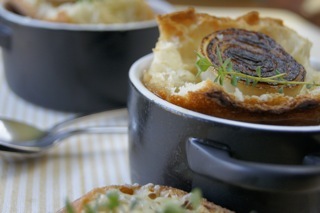 Ladle soup into ramekins or individual bowls, avoiding the bay leaves and thyme stalks. Slice baguette on bias (diagonally crosswise). 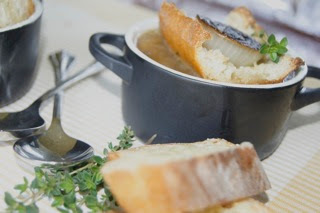 Float baguette slices on top of soup. Sprinkle with grated cheese. Bake until the cheese is melted and bread is toasted. 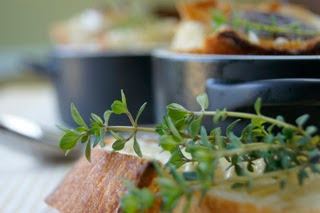 Serve with onion tops perched on toasts. Justine - isn't she très belle! Maybe I should try your soup. I've tried it at restaurants and haven't been impressed. 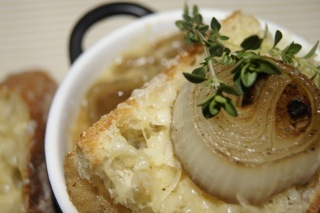 French Onion is one of my faves! This version sounds absolutely delicious and perfect! 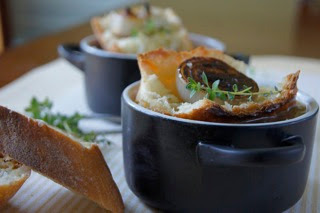 French Onion Soup is by far a favorite around here. Yours looks amazing! j'ai l'impression que tu vas très bien mangé pendant ton séjour au USA!!! Seedlings - Lights, Camera, Problem! Puerco Pibil - Johnny Depp Killed For This!